People tend to complain that weeds are pests. They tear them out and poison them, trying to rid their yards of the very plants that could feed them in an emergency. Here are some common weeds, which not only can provide the essential nutrients that your body needs to live, but also can be quite tasty if properly prepared. 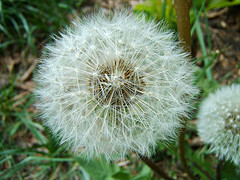 Dandelions pop up in early spring, coating lawns with a sunshine yellow before turning snowy white when they go to seed. They are a personal favorite weed of many people due to fact that, like a wishing well or the first star at night, they are used for wish-making. After the flower has turned to seed, kids and adults alike enjoy making a wish and blowing the seeds into the air. Others, who are more practical, prefer to eat them instead. While some families eat store-bought, iceberg lettuce, others prefer dandelion salad – the tender leaves of the dandelion plant mixed with oil, vinegar, salt, and pepper. This weed can also be used to make dandelion wine, a most delicious, sweet and light wine. The plant’s roots, when dried, are a perfect coffee or tea substitute that can rid the boy of toxins. Many do not realize that Queen Anne’s Lace is known as wild carrot. The flowers grow out in the fields, by the woods, and along fence lines. They are picked by children for centerpieces and are recognizable by the queen in the middle of the flower – the sole purple flower amid the crowd of white ones. This weed is member of the parsley family and its root looks and smells – and tastes – like carrot. But be warned, there are many species – such as water hemlocks, fool’s parsley, and poison hemlock – which mimic Queen Anne’s Lace in appearance, but are highly poisonous. True wild carrot has a flat-topped or umbrella-shaped head covered in tiny white flowers with the single deep purple flower, or the queen, at the center. The leaves are feathery and the stem is hairy. The plants grow in dry fields, and the root will smell like carrots. Harvest the roots, preferably of new plants, and eat in salads, grilled over the campfire, or even by themselves. Lamb Quarters can also be found in yards, gardens, roadsides, and along the banks of streams. These edible plants have scalloped leaves and are green with a white frosting on them. They grow in well-fertilized areas with rich soil. The leaves are quite similar to spinach, both in texture and taste, so adding them to salads or cooking in water is ideal. This weed is high in iron and potassium, like most dark green veggies. The tender leaves are preferred over the older, tougher ones. Be sure when picking wild plants to consume, that you don’t gather ones along heavily trafficked areas or near yards which you know to have been treated with pesticides.